The small boat was anchored at this pier in Garhoud. I found this picture very peaceful. The entire place was entirely deserted with this solitary boat bouncing about on the water. It was almost like time stood still. This is an old picture from my camera. I cannot remember where exactly I shot it. Many of my Muslim friends told that the way the moon is framed in the picture is supposed to be auspicious. I am not aware why it is but they all seemed to like it. I spent some time trying to follow the game but had to give up in a few minutes!. Went down to the Dubai Dolphinarium over the weekend. I just cannot believe how these beautiful dolphins can be trained to perform at the tricks!! and they seemed to be even enjoying themselves. I know that in the past there has been some criticism about the project on the basis of the way the dolphins are treated. Do you have an opinion? I know I have discussed abras in one of the early posts on this blog. But I could not resist sharing some of my recent ones!! I enjoy every bit of the ride on the abras and usually end up taking a few once I get to the pier. I guess an abra ride is the real experience of Dubai. On both sides of the creek one sees and experiences the hustle and bustle of traditional traders peddling their wares. When I first moved to Dubai, the sight of the cable cars always gave me a funny feeling. A cable car always brought back images of ski slopes and holiday resorts. So it was strange to find one in Dubai. Located on one side of Dubai Creek Park, the cable car set-up is a unique sight to most visitors to Dubai. I didn't see any of the cable cars moving though. Does anyone know if this thing still works? Watching the seagulls at Dubai creek is such a soothing experience. The sheer grace of its flight is almost like a slow dance. At times it felt like the seagull was only floating in air for several seconds. I was quite interested in this unique lamp post in one of the parks in Dubai. Interested because of its vibrant colors and design. It looked beautiful against the green background of the lawn from one side and a soft blue of the sky from the other. Had the opportunity to go down to Sharjah and visit the popular Al Qasba (formerly Qanat Al Qasba) area. Being the weekend, the place was buzzing with activity. Al Qasba is a specially developed facility for families and tourists and brings together culture, art, restaurants and general entertainment for the family. It has a general feeling of fun with loads of games (including a giant ferris wheel), several restaurants, abra rides and entertainment shows. The recent report in Khaleej Times was very interesting. 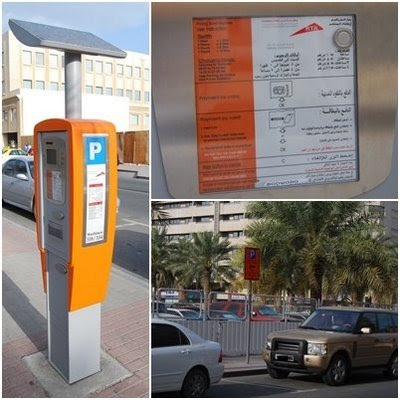 An Arab woman has run up traffic fines of about AED 73,000/- ($19,800). Motorists in Dubai owe the Dubai Police traffic department a total of AED 27 million!! The deaprtment now has drawn up a list of the top 100 motorists who owe the department the most in traffic fines. The roll of honor includes a Lebanese man who owes AED 70,000/- and an Egyptian man who owes AED 42,000/-. A Syrian woman owes 38,000/- while a Jordanian man owes 23,000/-. According to Dubai Police Traffic Violations Department Director Major Jamal Al Banay, the motorists can request to pay the fines in instalments if their vehicles are registered in Dubai. In afterthought, the reference to the tiny dhow seems somehow mocking. The only dhows on Dubai Creek these days take tourists on one-hour pleasure cruises. Ever since Germaine Greer's article in guardian.co.uk, I have been itching to go down to the Dhow Wharf at Dubai creek and have a first hand view of what exactly the situation is. So I took some time off and went down to the creek side to have a look at the dhows and their business. The place looked like it was business as usual. Lots of cartons of stock waiting on the banks to be loaded onto the dhows. The loaders were hurrying around at a brisk pace while a few were shouting out orders. I asked a few of the businessmen around the place about their business but they couldn't follow me. I later understood that they spoke Farsi only.